I've signed up and found it somewhat useful. I have three main routes to get to and from work, and while all three share one section of the bloor-danforth subway line, they start going separate at Yonge and Bloor. So, any disruptions north or east of there I can avoid given some fore-knowledge. Hell, even if the bloor-danforth line is out, I can maybe work from home. So I find the updates handy. The other thing about the updates is just mild interest in how the TTC is doing on any particular day. Today, the TTC was having an unpleasant afternoon as far as I can tell, with disruptions affecting all of my routes and likely causing some rush hour havoc. A section of the Yonge-University-Spadina Subway service is currently shut down from Sheppard Station to Lawrence Station. Shuttle buses are in service. A section of the Bloor-Danforth Subway service is currently shut down from St. George Station to Yonge Station. Shuttle buses are in service. A section of the Bloor-Danforth Subway service is currently shut down from Pape Station to Donlands Station. Shuttle buses are in service. A section of the Bloor-Danforth Subway service is currently shut down from Broadview Station to Woodbine Station. Shuttle buses are in service. With these, pretty much half the track in the east end of the city was at some point down for long enough to cause alternate bus service. All within an hour and a half of each other. I gotta feel for any TTC employees today, it must have been hectic. I luckily wasn't affected much due timing and a ride to an alternate station for a coworker. Thanks Dave! Anyhow, point is, update service interesting and useful! Thanks TTC. Today it has been one year since I started this blog! I've enjoyed writing about the random stuff that I want, and I hope that anyone who has stumble upon this has enjoyed reading it. Taking a look, I've had 1214 visitors in the past year with a bounce rate of 68%. Not much, but I'd say fairly surprising for a blog with no focus beyond whatever I want to say. I feel happy. Then again, I do this mostly for myself so even if I had 2 people reading, I'd be happy. I also want to thank people who've left comments. I like reading them. Anyhow, I've been short on the posts since my return from Korea, but I plan to get back into things more. Thanks! I decided to order in some pizza the other night as I was sick again and not in the cooking mood. First thing, I logged in with my user and I was told to fill in some additional details and that my account will now login by email address instead of user name. Ok, cool, pretty standard change. But...the email they have on file is from years ago and doesn't exist anymore. The field is read only, so I couldn't change it. Ok, Fine. Not ideal but I just made a new account. I signed up and entered in all of my data. It complained that my street name didn't exist and failed to save. I retry the name with variations: just the street name, the street name followed by 'Rd. ', the street name followed by 'Road'. It finally excepted one as a valid street in Toronto. Apparently you must divine the precise way that your street is represented in their database. But, the site then proceeded to come back to me with an error message! Now here is where the site really broke down. First off, error on user creation? Oh well, with the error I wasn't sure if all of my information got saved. It apparently created my account, since it said "Welcome Andrew" at the top of the screen but when I went to my account details page everything was blank. So, I refilled the details and attempted another save, but the email field was again read only...and was blank...and was a required field, so it wouldn't save. Hmm, blank email..that's not good. So, I decide to try to create another account. No go, apparently that email address was already registered, meaning it did save the first time. So why didn't it print on the page?! Clearly my name and email saved, but did they have my address? I decide to find out by placing an order. If it got delivered cool. I click to place a order and didn't get the order pages, I got a message saying that my local store was closed. It actually wasn't by the way. 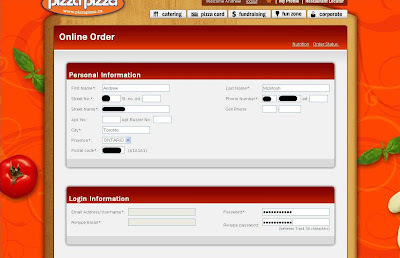 Now that means to me that they might have my address (as they can figure my local Pizza Pizza), though not proof really, as it could just be the answer of a final else statement or some default value. So I was done. Anyhow, I tried again last night for kicks, and everything is exactly the same, so this thing has been broken (at least for new customers, or a least for me) for a few days now. I seriously don't know how this sort of thing can go live.